OVERVIEW: The Foundation Astronomy Department has had dramatic increases in both funding and activity over the past decade. Under the UPWARDS YGGDRASIL Initiative1, the Astronomy Department has been investigating various areas of interest in the Milky Way Galaxy and extragalactic regions, aiming to determine what degree of anomalous activity humanity would encounter if allowed to colonize beyond the solar system. As of 1/1/2040 over 300 astronomical anomalies have been detected with 90 potentially anomalous phenomena observed. Outside of the Foundation's current range of explorable interstellar space. Within extragalactic space at distances where all light that reaches us is from the far past. In the case of phenomena, short lived and unlikely to ever repeat. Further information and full astronomical anomaly logs may be provided on request. 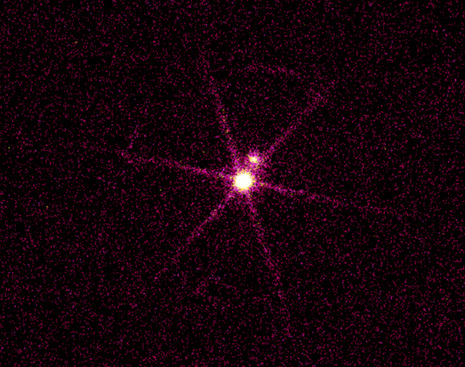 X-ray imaging of 10 Ursae Majoris. Description: Several objects superficially resembling bones orbiting 10 Ursae Majoris and its companion star, ranging in size from 10,000 km to 20,000 km, first registered by Foundation exploratory crews in nearby star systems. Metallic structures extending from them that are gradually expanding in size indicate possible signs of habitation. Description: HR 7644 was observed to be extending portions of its mass into luminescent "tendrils," which moved towards an orbiting object, circled around it, and shredded it. Spectrographic analysis of the plumes of materials released from the object indicate that it was likely one of the star's planets. The tendrils then retracted. Initial EVE heatmap imaging of the central AA-01289/MW/cTr object. Description: Ten objects invisible to all forms of light that are only observable from continuous Elan-Vital Energy4 (EVE) emissions. The objects orbit in a formation like that of a star system, a large central object producing the majority of the EVE output with the nine others orbiting it. Their distance from the solar system is yet to be determined, as more studies in EVE redshifting are necessary. 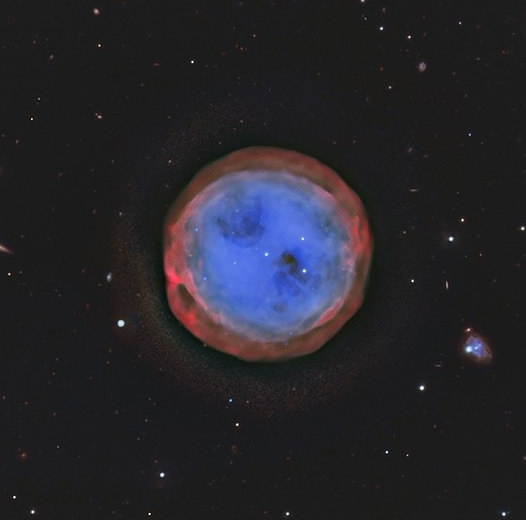 The objects are several of a number of recently discovered astronomical objects only visible from their EVE emissions. Increased funding for EVE astronomy has been approved. Full lists on discovered astronomical EVE sources require Astronomy Department Level 4 clearance. Description: WISE 0221+3842 converted from a brown dwarf into an ontokinetic mass. 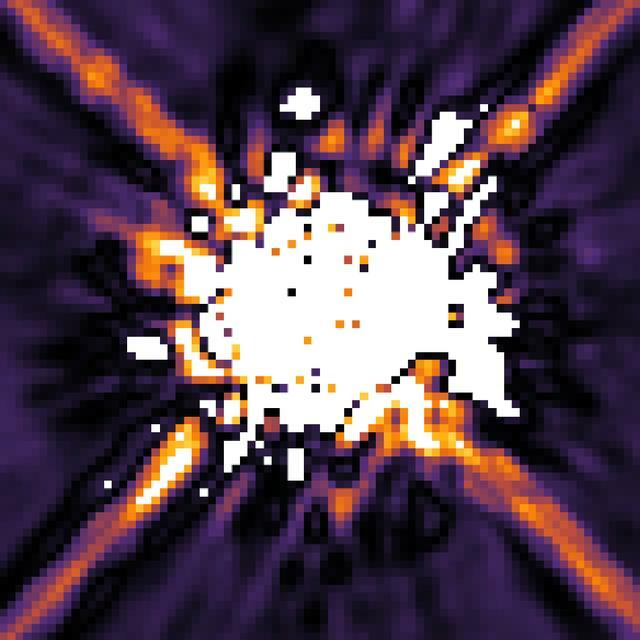 Light released by the star now erratically shifts in wavelength, generating a "white noise" appearance when viewed, and anomalous gravitational effects frequently occur, so far resulting in the ejection of orbiting debris at speeds in excess of 0.6c and the short-term formation of multiple naked singularities. The star is presently shifting into a spiral shape. 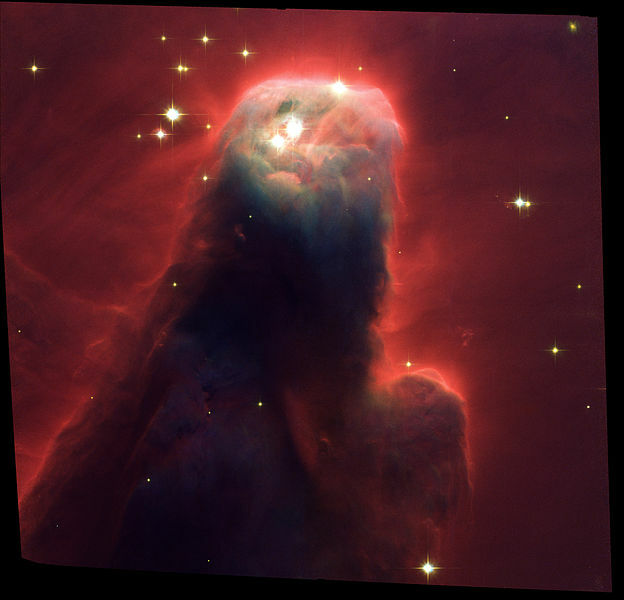 False-color image of the Cone Nebula prior to the manifestation of AA-00380/MW/cMO. Description: A massive entity (~0.5 ly long) formed from ectoplasm, which rapidly grew outwards from a smaller spherical mass into a similar to cydippid organism bodies, extending eight tendrils that stretch into the Cone Nebula. Structures formed from ectoplasm and a metallic substance extend from the "back" of the entity, having towers in which Class A stars are positioned at set intervals, ringed by structures presumed to be Niven rings or energy harvesting devices. Continued observation of the tendrils over six years has found that they exhibit a high gravitational attraction on the surrounding dust clouds and forming stars of the nebula. The leading hypothesis is that the entity is harvesting raw materials for itself or a civilization that inhabits it, the Cone Nebula being being its current resource supply. Further observation will be necessary to confirm this. Description: An octahedral galactic-scale megastructure structure formed from an unidentified exotic matter, size undetermined. Its function is unclear, though it is noted that from two of its vertices extend two spiral "arms," similar to the arms of spiral galaxies. Description: A rapid series of upwards of 60 Type Ia and Type Ib supernova within Terzan 2, followed by a series of X-ray communications emissions from SCP-3417. Ortothan Extraterrestrial Language specialists and extrasolar Ortothan personnel have so far translated commands to "construct light-speed lance shielders" and references of a "union of twelve stars." Plans to explore the cluster are in development. Description: Two objects similar to the now-anomalous WISE 0221+3842 manifest around the star system and enter, gravitational disrupting the orbit of its two stars and the system's planets. The objects then collided, formed a true vacuum,6 and contracted into an indefinitely small point. The stars and presumably all planets are destroyed. Hemispherical structures suspended over the star's poles to capture outflowing stellar matter from the lifter. Two conical luminal projectile cannons in equatorial orbits, half the width of the stars yet possessing minimal gravitational effects. Collected stellar matter is transferred to the cannons from the hemispherical structures via highly luminous particle beams, where it is converted into projectiles through an unknown process. The projectiles, which emerge the cannon barrels in the form of luminescent spheres at 0.1c, quickly accelerate to speeds nearing or reaching the speed of light before exiting the star system. What details of the hemispherical structures that can be observed display features bearing likeness to organic life, the most prominent ones being antenna, "fins" extending from the cannons that act as heat radiators, and thin tendrils lining the undersides of the hemisphere that move to fully direct stellar matter into them. The extent to which the cannons are biological is not known. Based on current observations, the estimated trajectories for each projectile place their target as being the WISE 0221+3842 star system. Description: A broken octahedral megastructure of the same make as AA-68790/EG/cOc. Half of it is torn off and missing, the remaining half expelling a cloud of machinery. This exerts a minimal gravitational attraction on surrounding stars, which seem to be in the process of dissipating outwards. One-third of the stars are being pulled by an unknown force into a spiral formation as wide as the megastructure. Frame from a computer simulation of the AA-00380/MW/cMo-01 explosion. Description: Gravitational waves are released by a point near the AA-00380/MW/cMo entity, corresponding to the formation of a wormhole from which a WISE 0221+3842-type anomaly emerged. The anomaly accelerated at 0.9c toward the entity but was impeded by an unknown barrier, forming a shockwave of energized particles as it attempted to progress. Extreme gravitational disruption of the nebula's matter began. One hour after entrance four thaumic glyphs, each at widths of 0.5ly and in the form of overlayed heptagrams, generated thin rods only visible in EVE emissions and fired them at the anomaly. Exact events for the next two hours are not known due to the ensuing 2×1044 J8 explosion. AA-00380/MW/cMo seems to have survived the event, though half of its body was disintegrated by the blast. The stars on its remaining towers have since noticeable dimmed. 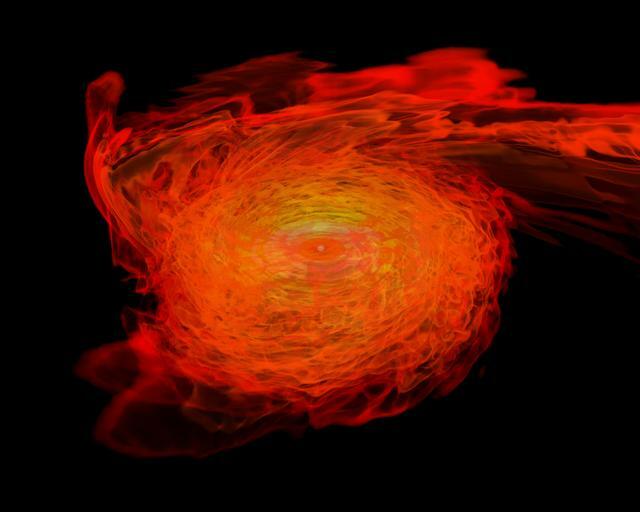 Description: A high energy X-ray burst forming the shape of the Foundation seal. The burst lasted for one hour before shifting into the formation of a circular spiral and ceasing activity. WISE 0221+3842-type anomalies manifested around and entered the nebula at speeds of 0.75c at this time. The nebula vanished eleven hours after. 1. Performed in conjunction with the Extrasolar Activities Division and Project Heimdall. 2. Explorations of several of the described areas will be performed upon completion of Project BIFROST. 3. Distances are in terms of distance from the solar system. 4. Particles used in thaumaturgic processes. 5. 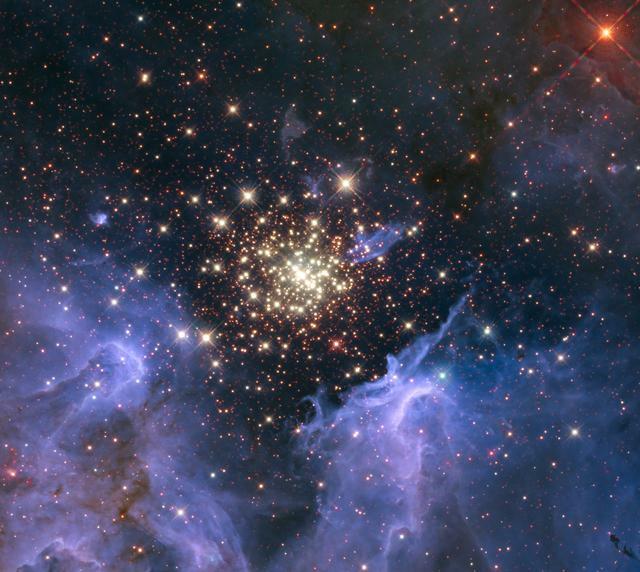 A dense cluster of stars, orbiting within the Galactic Bulge of the Milky Way Galaxy. 6. Determined based on erratic EM radiation emissions and unusual phenomena observed in the region. 7. A system in which statites suspended over the surface of a star heat it with lasers, increasing solar wind output, with a network of satellites orbiting the equator and forming a ring current to generate a powerful toroidal magnetic field. The result is the propulsion of solar wind towards both poles of the star, where magnetic rocket nozzles over each of the poles concentrate the wind into two outflowing jets. This enables an efficient method of harvesting material from a star while increasing its lifespan by preventing increases of size into unstable supergiant stars. 8. Equivalent to the energy released by standard Type Ia supernovae.